Fall is walnut season, and we have a couple of trees that were planted by the house, long before we ever lived there. 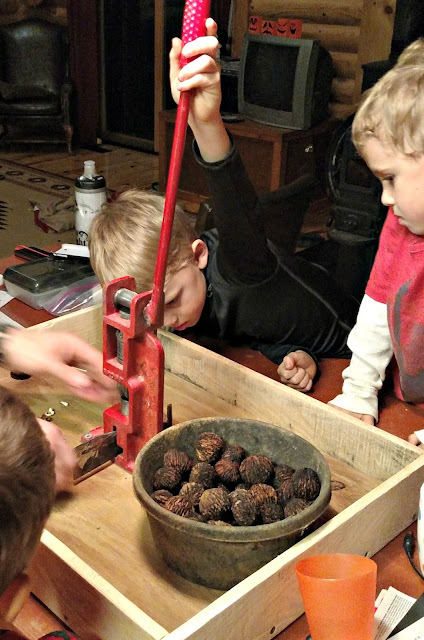 We put the twins to work gathering walnuts. They picked up hundreds! Paul's parents passed along a walnut cracker that was missing a piece. They picked it up at a yard sale for cheap. Paul was able to weld the missing piece, and built a cute little box to mount it in, with sides to keep the walnuts from flying around. Walnuts are the superhero of nuts. Ours are organic and raw, which have added health benefits. Walnuts have been shown to have health benefits on brain health, cancer, reproductive health and diabetes. I made candied walnuts for the first time and they are delicious plain or on oatmeal. We have a lot more to go on the walnuts, but we're cracking them, one shell at a time. Readers, do you have a favorite way to eat walnuts? Wow, that is an industrial strength nut cracker. I used a hammer when I did it so that looks wonderful. The boys will be able to make some extra money in the years to come with that device. 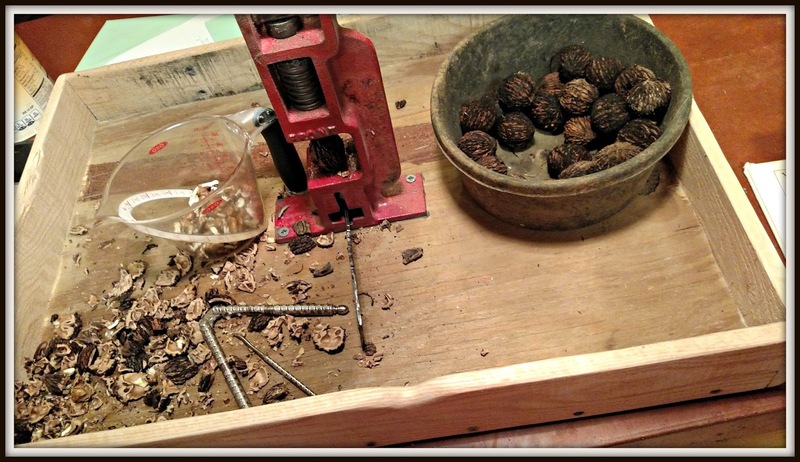 You are fortunate to have walnut trees - they are expensive in the stores, especially around the holidays. I have not tried them candied, but I know they would be tasty. My grandpa had a black walnut tree and would ask my mom to bake black walnut cake for him. I'm allergic to walnuts. Just looking at them there makes me uncomfortable! :-) LOL We had a walnut tree on the farm growing up. I remember when the walnuts were still green--kind of encased in a green shell--and if you got any of the "juice" from the green part on you, it was hard to wash off. Paul certainly is talented in making things! We have a lot of walnut trees on the property. It is a lot of working harvesting walnuts!! I have used them for dyeing wool, but have not done much as in the way of harvesting for eating. That is so cool and I love that you have a walnut tree! Good job little guys, and big guy. Yeah, I can't imagine shelling by hand, aren't they hard shelled? Interesting! Here, we have Kemiri, a kind of nut that almost similar to walnut. The shell is so hard, I think we should have a tool like as yours. Neat!!! I need to find a walnut cracker for the couple of trees we have. At least I will get something out of them other than picking them up and using em for fill somewhere. My Aunt & Uncle grew English Walnuts . . . I got to come stay with them in time for harvest - my job was to rake the walnuts out into the path - to be picked up and taken to the sorting house. We picked that chore for me because I played guitar for a living and we didn't want to risk my fingers. That is a cool nutcracker! We only had the squeeze handle kind of nut cracker! We love wallnuts too,, so good! What busy fun your boys are having! I like to use those nuts in baking and in salads. Yum! You candied them? I never did that myself. Candied sounds good! Walnuts taste bitter to me. This post reminded me of my Dad, who loved walnuts. How cool that the boys are so observant, picking up new ideas and having fun too! I like to sit out on the porch, and crack them, and eat them raw. That looks like a fun fall delight. And healthy snacking. You may remember the cream cheese fondant stuffed dates that Poppy made. She put a walnut half on top of each one. I loved those things! You always do so many fun activities with your boys! I love it! I like walnuts, but I have not eaten them lately. It's good to know walnuts are healthy food. Your children are growing so beautifully, sweetheart. Thank you for stopping by and caring to visit me, darling!! Many blessings for you all. Walnut Trees will bring you a small fortune if you sell them. We looked at a house to buy once that had them and the owner said he got offers on his all of the time. This is one that I usually just buy in a bag. They are so good in baked things! Candied walnuts sound delicious--especially during this time of the year. How cool that you're able to gather them right from your trees in the yard!